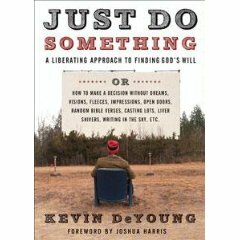 #10 Just Do Something: How to Make a Decision Without Dreams, Visions, Fleeces, Open Doors, Random Bible Verses, Casting Lots, Liver Shivers, Writing in the Sky, etc., by Kevin DeYoung, published by Moody Publishing. Hyper-spiritual approaches to finding God’s will don’t work. It’s time to try something new: Give up. Pastor and author Kevin DeYoung counsels Christians to settle down, make choices, and do the hard work of seeing those choices through. Too often, he writes, God’s people tinker around with churches, jobs, and relationships, worrying that they haven’t found God’s perfect will for their lives. Or—even worse—they do absolutely nothing, stuck in a frustrated state of paralyzed indecision, waiting . . . waiting . . . waiting for clear, direct, unmistakable direction. But God doesn’t need to tell us what to do at each fork in the road. He’s already revealed his plan for our lives: to love him with our whole hearts, to obey His Word, and after that, to do what we like. No need for hocus-pocus. No reason to be directionally challenged. Just do something. 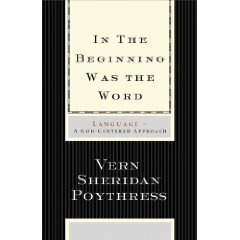 #9 In the Beginning Was the Word: Language–A God-Centered Approach, by Vern Sheridan Poythress, published by Crossway. With scriptural teaching and broad-ranging application, this follow-up to Redeeming Science builds a Christian theology of language and reforms our thinking about words. Language is not only the centerpiece of our everyday lives, but it gives significance to all that we do. It also reflects and reveals our all-sustaining Creator, whose providential governance extends to the intricacies of language. #8 The Righteous Shall Live by Faith: Romans, by R.C. Sproul, Published by Crossway. How exciting! Thousands of us have long been indebted to Sproul the teacher, and now, through the St. Andrew’s Expositional Commentary series, we are indebted to Sproul the preacher, whose sermons are thoroughly biblical, sound doctrinal, warmly practical, and wonderfully readable. This series of volumes is an absolute must for every Reformed preacher and church member who yearns to grow in the grace and knowledge of Christ Jesus. Tolle lege, and buy these volumes for your friends. 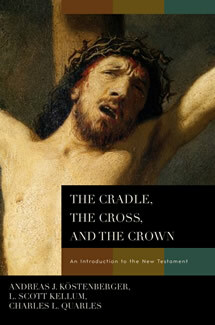 #7 The Cradle, the Cross, and the Crown: An Introduction to the New Testament, by Andreas J. Köstenberger, L. Scott Kellum, Charles L. Quarles, published by B&H Publishing. Although Scripture cannot be reduced to a mere piece of human writing, there is much to gain by paying careful attention to the historical, literary, and theological dimensions of the biblical text. For this reason, The Cradle, the Cross, and the Crown is offered to the serious New Testament student who seeks to better understand and share God’s “word of truth” (2 Timothy 2:15). Across nearly one thousand pages, it thoroughly introduces all twenty-seven New Testament books and closely examines Christ’s incarnation and virgin birth, the heart of His ministry shown so vividly in the Gospels’ Passion Narratives, and the triumphant return of Jesus and our eternal reign with Him as depicted in Revelation. 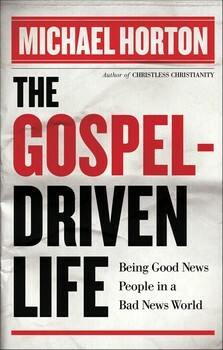 #6 Gospel-Driven Life, The: Being Good News People in a Bad News World by Michael Horton, published by Baker Book House. In his well-received Christless Christianity Michael Horton offered a prophetic wake-up call for a self-centered American church. With The Gospel-Driven Life he turns from the crisis to the solutions, offering his recommendations for a new reformation in the faith, practice, and witness of contemporary Christianity. This insightful book will guide readers in reorienting their faith and the church’s purpose toward the good news of the gospel. The first six chapters explore that breaking news from heaven, while the rest of the book focuses on the kind of community that the gospel generates and the surprising ways in which God is at work in the world. Here is fresh news for Christians who are burned out on hype and are looking for hope. 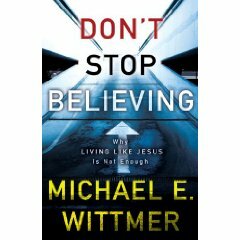 #5 Don’t Stop Believing: Why Living Like Jesus Is Not Enough, by Michael Wittmer, publishing by Zondervan. Evangelicals who reject the narrow fundamentalism of previous generations are in danger of over-correction. Don’t Stop Believing is an urgent call for both right practice and right belief. Our concern for social issues must not diminish the core doctrines of our faith. We must not stop believing. #4 The End of the Law: Mosaic Covenant in Pauline Theology, by Jason Meyer, published by B&H Publishing. Commonly understood as the first theologian of the Christian faith, Paul set forth the categories by which we describe our relationship with Christ. Did he understand the new covenant Jesus announced at the Last Supper primarily as a replacement of the old Mosaic covenant God made with Israel, or as a renewal and completion of the old? Jason Meyer surveys the various differences that have been argued between the two covenants in The End of the Law, carefully and inductively performing a semantic, grammatical, and contextual analysis of all the Pauline texts dealing with covenant concepts. 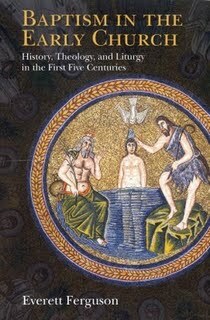 #3 Baptism in the Early Church: History, Theology, and Liturgy in the First Five Centuries, by Everett Ferguson, published by Eerdmans. Everett Ferguson’s work here is a compendium of almost everything that is currently known about the Christian ritual of baptism, with extensive citations to the primary and secondary literature, and as such is destined to be an extremely valuable reference work. #2 Our Secure Salvation: Preservation and Apostasy, by Robert A. Peterson, published by P&R Publishing. Can believers lose their faith? Robert Peterson addresses an age-old question crucial to an insecure modern world. Tracing preservation and apostasy throughout the Bible, he illustrates how God saves and keeps his people, giving them confidence to live for his glory. #1 Dual Citizens: Worship and Life Between the Already and the Not Yet, by Jason Stellman, publishing Reformation Trust. New covenant believers live between “the already” and “not yet,” a point in redemptive history between the partial and complete fulfillment of God’s promises. This means they are exiles and pilgrims in the divinely ordained overlap of the ages. As Rev. 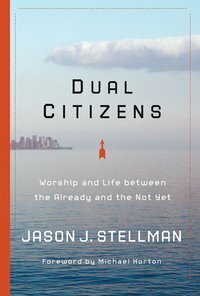 Jason J. Stellman argues in his book Dual Citizens: Worship and Life Between the Already and the Not Yet, this biblical motif shapes the identity of Christians at every turn and affects their every activity in both the sacred and secular realms. Stellman explores the Christian pilgrimage with deep biblical insight, humor, and relevance to our contemporary context, revealing how Christians are to think of themselves and their role this side of heaven. EXCELLENT reviews! #s 10, 8, and 1 are on my list now for 2010. Great suggestions!